The future of David Moyes remains uncertain a day after reports emerged the 50-year-old Scot's 10-month reign as Manchester United manager was over. 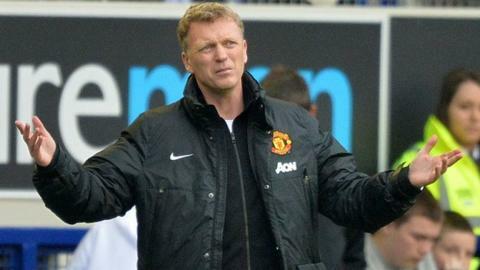 The Premier League champions insisted on Monday that Moyes, who succeeded Sir Alex Ferguson, had not been sacked. But national newspapers are adamant the club will dispense with the ex-Everton manager's services after a poor season. When pressed on whether Moyes was leaving, a spokesperson replied: "We do not comment on speculation." But most newspapers expect him to be gone in the next 24 hours, with coverage of his seemingly imminent departure filling both the front pages and back. "You wouldn't expect Moyes to be manager by the end of this evening, otherwise it's just cruel," said Shaun Custis, chief football writer for The Sun. "It's like death by a thousand cuts." Former United captain Gary Neville, who made more than 600 appearances for the club, wants the situation resolved quickly. "Usually they don't comment on anything, but they're going to have to clarify this position quickly," Neville told Sky Sports. "They might have to break rank and do what they don't normally do and make a statement pretty quickly." As the speculation continues, security guards at United's training ground told reporters on Tuesday morning that Moyes had arrived at 0500 BST. But coaching staff heading to Carrington say they have not yet been told anything about their futures. Netherlands coach Louis Van Gaal, Borussia Dortmund boss Jurgen Klopp, Atletico Madrid's manager Diego Simeone and Paris Saint-Germain's Laurent Blanc have already been tipped as possible successors to Moyes. However, reports suggest United winger Ryan Giggs could be part of a temporary management team until the end of the season. United lie seventh in the table with four games left and cannot qualify for next season's Champions League following Sunday's 2-0 loss at Everton. Whatever happens in those remaining matches, United will record their lowest ever points tally in the Premier League. Moyes was handed a six-year-deal after being chosen by Ferguson to replace his fellow Scot after 26 years in charge of Old Trafford. Under Moyes, United have lost six league games at home, been beaten in the FA Cup by Swansea and were unable to prevent Sunderland knocking them out of the Capital One Cup at the semi-final stage. In March, supporters chartered a plane to fly overhead trailing a banner with the words "Wrong One - Moyes Out" during the Premier League win over Aston Villa. The Reds will also miss out Champions League football for the first time since 1995 and are in danger of missing out on European competition altogether for the first time since 1990. Moyes has been dogged by claims of fallouts with his squad. When United midfielder Anderson joined Serie A side Fiorentina on loan in January, he was quoted as saying other United players "wanted out", although he later denied he had made those comments. Rio Ferdinand and Robin van Persie also made less than complimentary comments about the Scot's management style, while Javier Hernandez and Wilfried Zaha posted cryptic quotes on Twitter. This weekend, Manchester-born striker Danny Welbeck was reported to be considering his future after becoming frustrated at regularly being played out of his favoured position. Moyes left Everton after 11 seasons saying he could not turn down the opportunity to move to Old Trafford. He began the task of replacing Ferguson, who won 38 trophies during his time at the club, on 1 July. However, United endured a difficult summer transfer window and failed in reported bids for Barcelona's Thiago Alcantara and Cesc Fabregas. A double bid for Marouane Fellaini and Leighton Baines was dismissed as "derisory and insulting" by his old club Everton, although Fellaini finally joined on transfer deadline day for £27.5m. Moyes was unhappy with United's difficult schedule at the start of the season, during which his side played Chelsea, Liverpool and Manchester City in their first five games. But his reign began in style with a 2-0 victory over Wigan Athletic in the Community Shield at Wembley, followed by a 4-1 win away at Swansea City in the first league game of the season. However, things quickly deteriorated, with defeats at rivals Liverpool and Manchester City just two of 11 league losses so far this season in what will be United's worst ever Premier League campaign.